Apple has been planning to move its Stockton and Ellis Apple Store location – the spot it has used for the past 9 years – to Union Square. Last month, Apple earned approval from the city of San Francisco to do so, but was still waiting on a green light from the city's board of supervisors before beginning construction. That nod of approval, in addition to one from the San Francisco Planning Commission, was just received, Re/Code said recently. 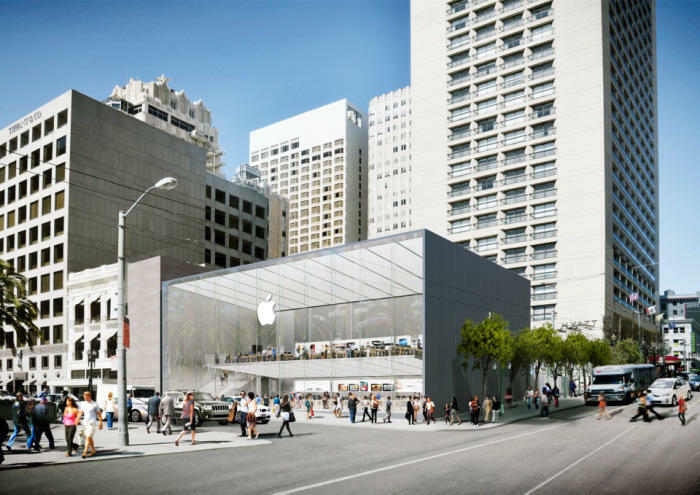 "We are thrilled that the city of San Francisco has given its final approval to begin work on our new store and public plaza, which will make a wonderful addition to Union Square and create hundreds of local jobs," Apple told Re/Code in a statement. "Our Stockton Street store has been incredibly popular, welcoming over 13 million customers since it opened nine years ago, and we look forward to making a new home on Union Square." Apple's new location was once home to a Levi's flagship store. The new location will have large glass panels on the facade, though we argue it still won't look as iconic as the Fifth Avenue glass cube location in New York City. Apple's new store will be 45 percent larger than the Stockton location and should allow for 50 additional Apple Store jobs. The rest of the careers Apple cites will likely be earned by companies drafted to construct the store. The hope, too, is that a Union Square Apple location will bring shoppers to other retailers in the area. Apple hasn't said when it will break ground on construction.